The editor of an award-winning daily newspaper has stood down after 31 years in journalism to be replaced by her deputy. Emma Turton worked her last day at the Burton Mail, where she has spent the last 15 years, on Friday. Emma, who was the Mail’s digital editor for four years and deputy editor for five years before taking on the editorship three years ago, said she decided in the summer to step down. She remained in charge “to help bed in a number of structural changes”, but her erstwhile deputy Julie Crouch has now stepped up to the editor’s chair. 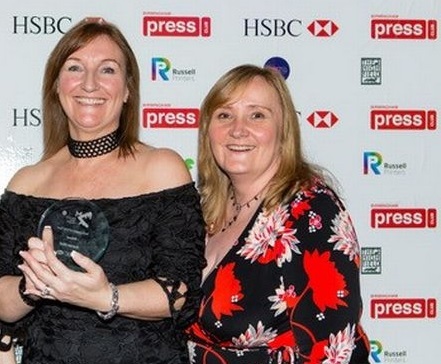 Emma said she would leave “on a real high” after winning Newspaper of the Year title at the Midlands Media Awards last month – describing it as her “absolute highlight”. She added: “I have had the most amazing time as editor here, and in newspapers in general. Julie began her career 30 years ago at the Ilkeston Advertiser, later moving to the Derby Telegraph and then editing several weekly titles in Derbyshire for six years. She moved to the Burton Mail as deputy editor just over three years ago, her second stint at the paper, having previously covered business, worked on the newsdesk and as a sub-editor over a 13-year period. Julie said: “I am delighted to have the chance to take the reins at the Burton Mail. As deputy I have played a pivotal role in the small but dedicated and hard-working team. All the best, Emma. Enjoy whatever you do next. “Stepped down”. Is that really Trinity speak for “was made redundant”? All the best with your next venture, Emma. You made me feel so welcome at the Burton Mail and it was a pleasure working with you. I’ll always be proud to have been part of the superb Mail team under your editorship. Why would you ‘decide to leave’ after 31 years unless you’ve had enough of the job or the company or had the decision made for you?especially with no other job to go to and when jobs within the industry for ex editors are few and far between. Good luck Emma hope it all works out for you. The incoming “Brand Editor” (whatever that is) won’t have that long to “punch above our weight” before the Mail simply gets absorbed into the Derby Telegraph before she “decides to leave” / aka gets made redundant. This departure seems similar to the previous editor, who after being at the Leicester Mercury for a few years, also left to “explore new ideas”, seemingly the Trinity euphemism for being made redundant. It’s interesting that there’s no comment from the publisher on this departure in the piece?